That new deck looks great. But just because it looks good now doesn’t mean you can completely ignore it. Your wood deck requires regular maintenance. And even though you are not using your deck during the winter, that doesn’t mean there isn’t work to be done. Removes Leaves, Snow, and Debris: If moisture is allowed to sit on your deck for an extended period of time, it will soak into the timber, damaging your wood deck and creating the perfect breeding ground for mold and mildew. Clean the Deck: You can either mix equal parts bleach and water and scrub your deck clean or you can rent a power washer and blast your deck clean. Timely Repairs: Even with regular maintenance, your wood deck may still become damaged. When this happens, it is important to fix the issue as soon as possible to avoid letting the problem snowball out of control. Tired of all the Deck Maintenance? Consider a Low Maintenance Deck from Freedom Fence & Home! Low maintenance decking is a great way to enhance your backyard without the maintenance of a traditional wood deck. So it is no wonder that homeowners are moving away from wood and opting to instead go with a low maintenance deck from Freedom Fence & Home. 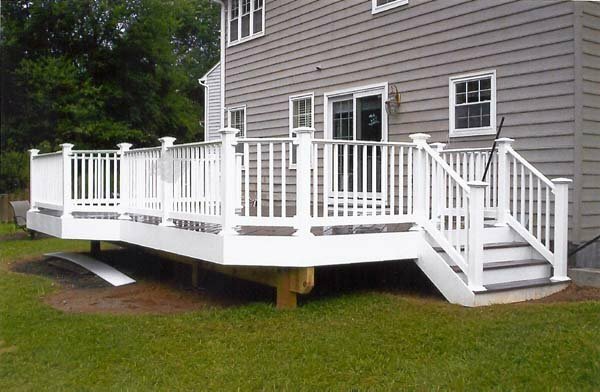 Freedom Fence and Home has over 40 years of experience building high quality decks for both residential and commercial clients in and around Baltimore, Maryland. Why would you call anyone else? This entry was posted on Wednesday, January 30th, 2013	at 4:30 pm	. Both comments and pings are currently closed.